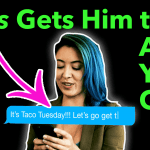 In this week’s video, I’m going to give you 3 killer texts that show your standards, put you back in control, and double his attraction for you. Like I said, this secret is hugely powerful. Hats off Mathew this is how women should.respect themselves!! Hi Matthew, I wanted to say thanks for this site and the info on it. When I was single in my teens and early 20s i found dating pretty easy – I knew how to get guys to like me and respect me. Coming back into dating in my 30s has been a shock! I’ve totally forgotten how to do it, plus there is the extra pressure of seemingly everyone else having married and had kids so dating just doesn’t seem as fun as it used to. But this site has really helped remind me of how I used to find dating fun, and to maintain myself as high value. Glad you seem to be doing well to! Two production elements that I find really fun and lovely: having the actors lip sync to Matt’s voice with its adorable accent, and the boku inspired closing screen, with the golden lights against a black backdrop. Matt has a great message, and fittingly he doesn’t throw it up online in the equivalent of a paper bag when it comes to production and visual presentation. The understated but elegant details tell me he has someone working behind the scenes who has the heart of an artist. Imo one of his smarter moves was finding a creative person to put the right bow on his *ahem package lol well done! Hey there! I hooked with my ex a few weeks ago, he said we should gor for drinks the following week.. then on parting at the statio he repated I’ll text you and well go for drinks. The funds are low but..to which I said I could finance that time round.. I waited the following week to text him “how was your bank holiday weekend, bit quieter? ” Nothing..Rude right? I feel like texting him: are the funds so low you can’t affort to text back? Thats cheeky and lighearted but show my standards, courtesy it vital. Dear Matt, I’ve been listening to your advice for a number of weeks now, I recently purchased your book ‘How to get the guy’ from Amazon, and almost signed up to an online course, but increasingly I’m feeling that your advice isn’t very relevant to my particular case, but I am starting to feel out of my depth. I met a lovely man on a dating site 5 months ago, he’s a few years younger than me, I’m 56 with 3 practically grown up kids, the youngest is 17. Currently getting divorced but separated a few years, and this is my first relationship since my separation. I’m also disabled with arthritis, I need a hip and knee replacement, the hip is being done in a few weeks time. Anyhow, Craig lives 79 miles away, neither of us can drive, we chat almost daily on face book etc, we have lots in common, but so far only managed to meet up once when I stayed with him for a few days. It is very distressing since I feel in love with him, but we are both on sickness benefits. Recently I looked at his history on his face book page and from this I discovered that he had treatment 3 years ago, for Borderline Personality Disorder. I think it caused his short marriage to fail in 2013, although he has 2 grown up sons with another partner from his past. What I’m trying to say is that as good as your advice undoubtedly is, it really seems to me that it suits a particular age group of people, mostly the young, never previously married, and healthy, and also financially sound individuals. I don’t know what advice I could benefit from, Craig is supposed to be coming to see me before long to build some furniture for me before I go into hospital, and I’m longing to see him again, but with so many problems like distance, lack of finances, physical and mental health problems, it is hard to see how to go forward, some of your advice would probably have sparked a fear of abandonment in him, if I’d held back from messaging him to try and make him take the lead for example…He sends messages eagerly for a number of days, and I’m on cloud 9, and then goes all quiet for days on end, not even opening messages I’ve sent him. Recently he explained he’d been suffering depression. He cancelled 3 visits I’d planned, to him, over the summer.He says he really likes me though and wants to see me again, I just don’t know what to do really, and sadly I don’t think you could work this one out either. You’re a lovely young man though, your mum must be proud of you! It’s nice listening to your videos but I wish I felt they were relevant to me…. Hi, I happened upon your comment re. your situation. Although I cannot claim to fully understand what it is like to be involved with BPD, I have lived a lot of life for someone who just turned 30 due to growing up with a parent affected by severe depression, other mental health issues & we now know has evolved into early on-set dementia. I myself have suspected to be Asperger’s since early childhood & feel very lucky to have found someone who loves & understands my quirks & social difficulties. Your physical & financial challenges can improve over time, however when faced with someone who is essentially wired very differently from the norm such as Asperger’s & BPD, the only way to love that person is to understand the many twists and turns those wires can take them & be very compassionate without judgement. It is also important to think long term because to be that person’s ‘human’ often requires stronger will & commitment than any relationship between two healthy adults, as being a person outside the norm does create attachment issues which make us more sensitive & nothing hurts more than to have our quirks we can’t control be misunderstood. Not to be a downer, of course, but these are serious issues you need to consider for yourself as well & if you are confident you can brave whatever storm he throws at you, great! If not, it may be best for the both of you to give him the space he needs in order to find his unicorn. Wow, cool video! I’m not so good at replying to chats, and this would totally help me. Thanks a lot, Matt!! WOW! Can completely relate to this – “Why don’t men try anymore?” Have thought about this many times…. truth is it’s because they’re lazy, because they have been conditioned by women and ‘allowed’ to think its ok. Maybe we’ve all gotten lazy. It really is disappointing. I’ve always had standards, but honestly have ‘bent’ those standards if I really liked a guy. I haven’t lowered my standards in quite sometime though and guys still are not stepping up. Yes, they all say all the right things…. talk is cheap though, I need to see action. I need them to ‘show’ me I mean something to them and it doesn’t have to be some Big Grand Gesture. (Although those will work magic ;) I have told them this over and over. Maybe I’ll try softening it up by being even more playful that I currently am. Other than that, I do not know what to do. Thanks aaagain Matt! I am currently ‘checking out’ an old flame out. Because of our history things moved faster than I would typically allow. I wished I had taken it slower bec he quickly became lazy and too laid back, just like you describe in this video. I trusted your advice and when he texted me Friday night at 8;30 with ‘what are you up to’, I erased my immediate ‘salt only’ response, and forced myself to wait until the next morning. Dished him up a nice ‘salty, sweet Mathew special’. Ladies this stuff works, on ANY guy, ANY time. This is some profound work you are doing indeed, keep it up. This is really optimistic and superlative and I learned a lot thank you. I sent my crush a text yesterday. He is in Colorado visiting and we have not spoken, its a long story. But I told him ” I hope your enjoying Colorado, but you need to get back here where it is hot and steamy.” With a volcano and smooch emoji. So this morning I get a text from him. “Why did you send me that…” LOL I worked for him, but I quit because I couldn’t let him hit on me every time I saw him, and I really started to like him… a lot… I don’t know what to say to him. I want to tear off you cloths? Dr Pat Allen is the authority on how to be in our feminine and masculine and how to behave/speak like a balanced lady or gentleman. Listen to her podcasts on iTunes. She’s 86, politically incorrect but scientifically accurate. You are not the tha alpha or the sperm, do not chase or you’ll end up with a beta that you’ll control initially but quickly resent. Learn to become a lady and be with a real man. A high value woman sets her boundaries and standards early on in the dating cycle. Too many men have become lazy and complacent. And if he is not willing to make the effort, move on to the next! Love the texts, Matthew. Thank you!!! Love, Love, Love your bliss point theory and methods. As always I feel inspired, supported and encouraged to never compromise my standards BUT to rather communicate them in a playful, non punitive, opened hearted feminine way where he has the opportunity to step up and engage. Btw … did you receive the poem I posted to you last week? Hi Gloria. Please write to support@howtogetttheguy.com – they should be able to give you access to the 9 texts in no time! You’ve done it again!!! Terrific Sunday message. in making our lives better. The idea of the Bliss Point is super insightful and intelligent. I appreciate how you identified a term normally used in the fast food industry to correspond to our love lives as well. Thanks so much for continuing to share ways for how we as women can communicate our high standards to men in a loving and playful way. Mathew! Best relationship coach I’d ever seen. I’m from Nigeria and I’m a fan of your advice. Thanks math. The third message is genius!!! The only thing I don’t like about this strategy is that it assumes that men are acting like low-standard boys. Instead of putting the onus on them to be mature, you put the onus on us to raise them– like mothers. I never want to treat my partner with any condescension which I feel this video subtly implies. I thonk Cleopatra makes a fair point … and with a name like that, I’m persuaded to give her opinion some weight lol. I wonder what Matt would have to say about this? Why do men default to childlike behavior, leaving it to women to be the standard-bearers? We don’t forget to brush our teeth and comb our hair just because we don’t expect company that day. Why would men who respect themselves disrespect a female they want to be close to … nevermind. Lol anyway, good question. Maybe they are just testing us, again like kids testing parents’ boundaries. A lil hard to find that attractive, but easier to manage I guess.